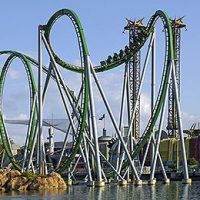 From pirate extravaganzas to hoedowns hosted by characters, Orlando serves up a variety of themed dinner shows. These are our picks — listed by category — for the best events that combine evening entertainment with family-friendly meals. 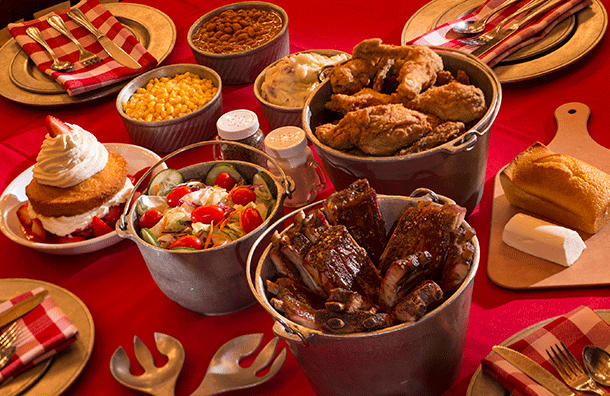 Again and again, families return to Disney's Fort Wilderness Resort & Campground, where they sing, dance and chuckle along with the Hee-Haw crew at the Hoop-Dee-Doo-Musical Revue, a rollicking Western-themed dinner show. 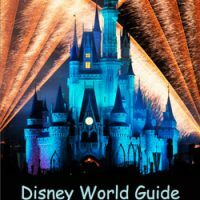 At this all-you-can-eat favorite, your gang will enjoy plenty of cast interaction, along with a belly full of wholesome food that many claim to be the best in Disney World. The family-style menu features kid-pleasers like fried chicken served in buckets. For dessert, everyone will enjoy the strawberry shortcake. Wine, beer and soft drinks (served in jam jars for adults) are included, as is gratuity. Before the show, games (hula hoops, horseshoes and the like) and a nearby playground keep the kids entertained. Also at Disney's Fort Wilderness Resort is this "campy" production staged seasonally. Held in an open-air pavilion, the rowdy, foot-stomping all-you-can-eat dinner show features an opportunity for the little ones to dance along with Mickey Mouse, Minnie Mouse, Goofy and Chip 'n Dale, while parents capture the fun on video and camera. Afterward, everyone can enjoy the formal show, which includes a country western band and a trick roper. As far as "vittles" go, families will find plenty to satisfy, including chicken, ribs, hot dogs, macaroni and cheese and, for dessert, Mickey Mouse ice cream bars and giant popsicles. Beverages, including beer and wine for adults, are also included. Seating is communal at picnic tables, and is assigned on a first-come, first-served basis. Strollers are not permitted in the pavilion, but high chairs are available. 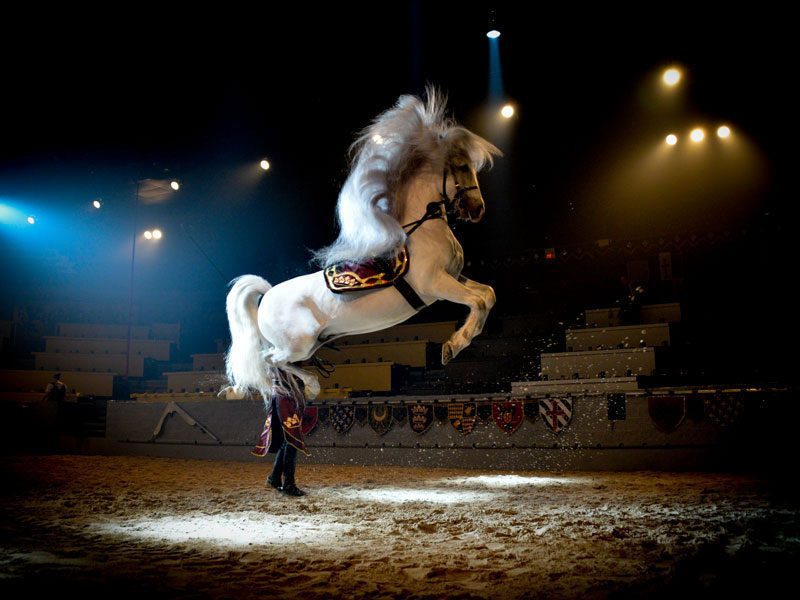 Root for your appointed knight in this swashbuckling, sword-fighting theatrical adventure, which combines the elements of fantasy, horsemanship and a ton of "hands-on" fun for the whole family. No utensils are used during feudal feast, giving kids "free reign" to forget their manners. The menu includes soup, roasted chicken, spare ribs, potatoes, a puff pastry dessert and soft drinks. An upgraded "Royalty Package" gets you preferred seating and a flag to wave. A vegetarian option is available with advance notice. The show is two hours in duration. Afterward, kids can meet with "royalty." 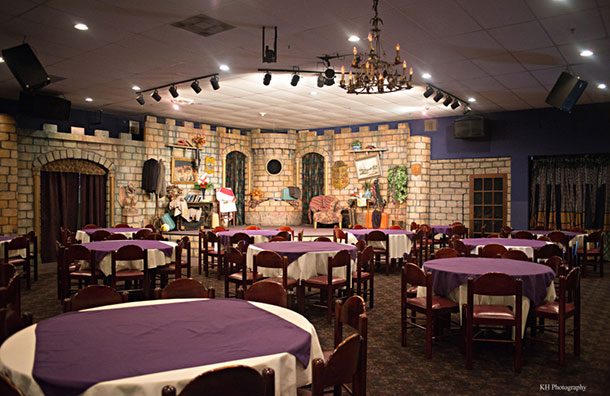 One of nine "castle" locations in the Medieval Times chain, the Orlando Medieval Times dinner and tournament has been in operation in Kissimmee for over 30 years, and includes an eight-building "Medieval Village" that you can tour before the show. Children under the age of 3 are free if they sit on a parent's lap, but for maximum enjoyment, it's a good idea to get a seat for children ages 2 and up. Sign up for a "King's Birthday Fellowship" and receive free admission on your special day with a paid adult admission. 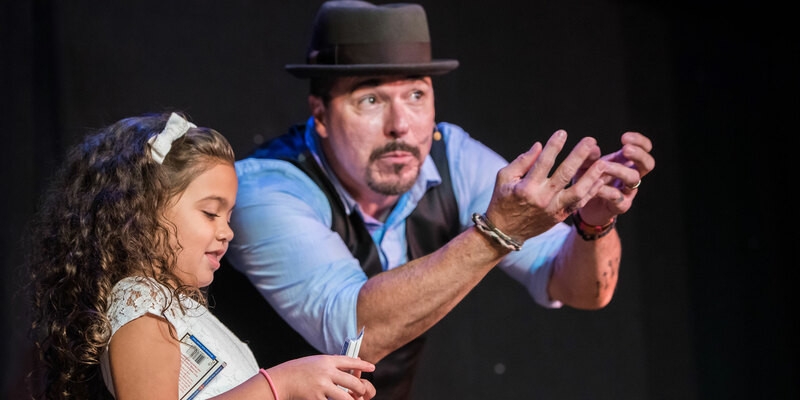 Magic tricks, music, big belly laughs and a kid-friendly menu top the list of reasons to make this upbeat dinner show part of your next Orlando vacation. 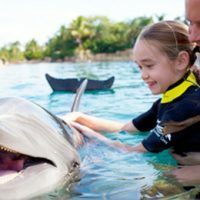 You'll enjoy unlimited popcorn, pizza, salad and cake during the 90-minute show, which, at $30 per adult or $20 per child, is priced significantly lower than most other area dinner offerings. Adults enjoy unlimited beer and wine. Soft drinks and water are also included. Seating is on a first-come, first-served basis. Arrive early (30 to 45 minutes prior to the show) if you want seats near the stage. Bring some diversions to help ease the wait in line. You can purchase tickets separately or as part of a package, which includes admission to WonderWorks, located next door. 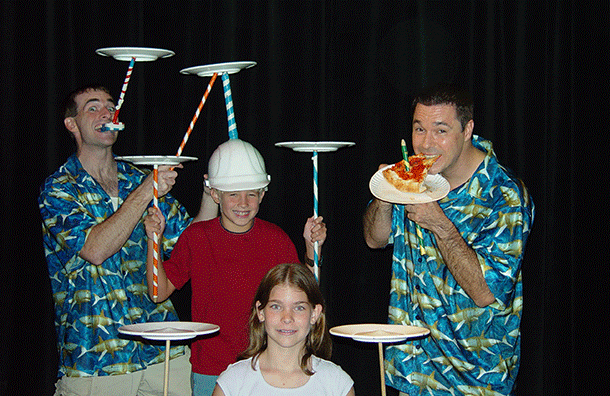 Walt Disney World isn't the only player in town when it comes to putting on a tropical dinner show the kids can participate in. One to two times a week at Loews Royal Pacific Resort at Universal Orlando, families can shake and shimmy with Hawaiian hula dancers, watch a fire performer in action and enjoy a buffet dinner featuring Polynesian specialties and kid-favorites like chicken tenders, peanut butter and jelly, macaroni and cheese, fresh fruit, and cheese pizza. The food, as well as the fire dancers, get high marks from kids, but be sure to fill up early, as the buffet is not open all night. Soft drinks, wine and beer, Mai Tais and gratuity are included. The show plays on Saturday nights year-round, and on Tuesdays seasonally. Arrive early if you want a good seat. Priority seating is available for an additional fee. 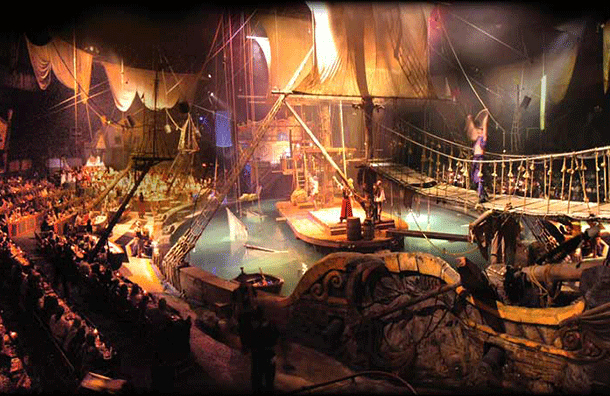 Aspiring buccaneers stand a good chance of joining the "Pirate Crew" at this action-packed dinner show, which emphasizes swordplay, special effects, aerial artistry and audience interaction. Cheer on your group's pirate mascot during the adventure, when you'll sit in a ship surrounding a massive Spanish galleon, anchored in a 300,000-gallon lagoon. Plenty of pyrotechnics, cannon blasts and an opportunity for guests to join the crew on the ship stage keep the night lively. Adults choose from roasted chicken breast or beef tenderloin, while kids have the option of ordering from the adult menu or selecting more familiar fare, like macaroni and cheese or chicken nuggets. Upgraded priority seating and a VIP package, which includes front-row seating and guaranteed cast interaction, can be added for an additional charge. 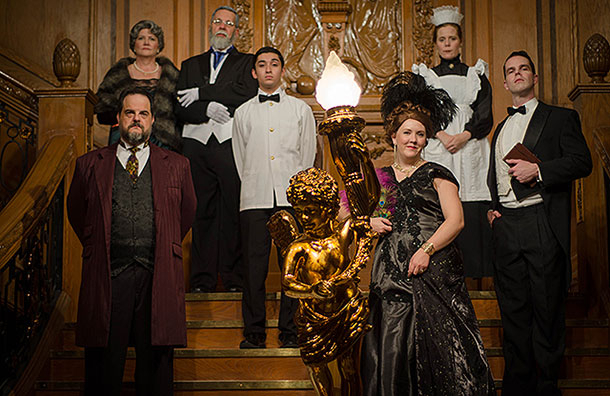 Take your teens to this fun-filled "whodunit," where a talented cast offers non-stop laughs and interactive entertainment. From appetizer hour to "mystery" dessert service, you'll feel like you're attending a private dinner party, which is part of the amusement, as well as the experience. At the show's conclusion, guests get to guess the correct identity of the criminal, and prizes are awarded to those who successfully solve the mystery. Menu choices include four-cheese lasagna or honey-glazed Cornish hen, or for an additional fee, prime rib. Beer, wine and soft drinks are included. Kids ages 3 to 11 dine on chicken tenders, macaroni and cheese, and green beans. The show is around 2.5 hours long, including a one-hour pre-show, dessert and dinner. 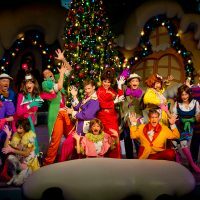 Various show themes, including special holiday shows, are offered throughout the year. 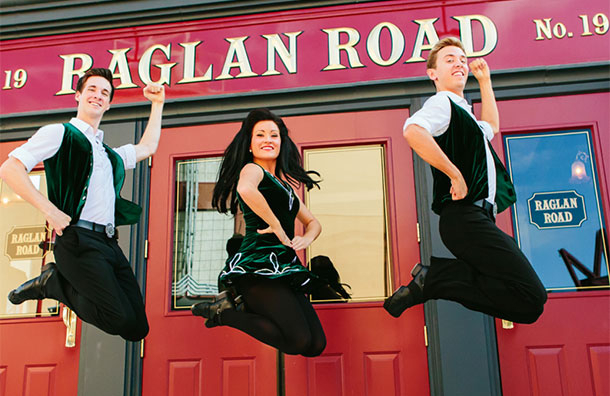 You don't have to be Irish to "step" into the fun at Raglan Road, an Irish restaurant with a chef, menu, band, dancers and bar imported straight from the Emerald Isle. Although not a formal dinner show, the Downtown Disney dining venue offers some of the best evening entertainment around for families, including live in-house Irish bands and Irish step dancers who often "reel" kids onto the stage to participate in the merrymaking. The venue is open seven days per week, and reservations are highly recommended. There is no admission charge, except for special events like St. Patrick's Day. A full kid's menu is available. 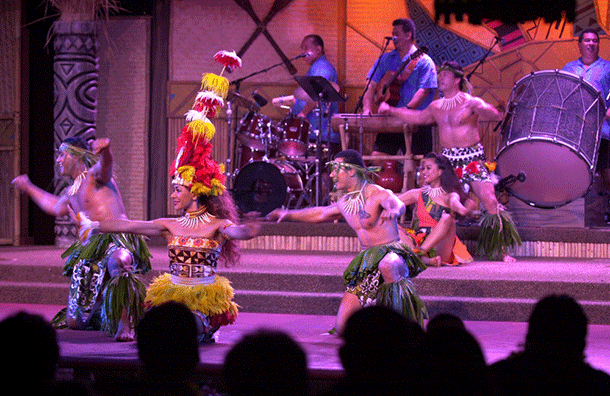 At Disney's Polynesian Village Resort, fire dancers, drummers, hula girls and a chance for guests to take the stage with professional performers are highlights of this fun-filled show, which pays tribute to the islands of the Pacific. Among the tropically inspired treats are pineapple-coconut bread, Aloha pulled pork and warm pineapple bread pudding with caramel sauce. A limited children's menu is available. Soft drinks, lemonade, coffee, beer and wine for adults are served, and gratuity is included. The show is held at an open-air theater overlooking Disney's scenic Seven Seas Lagoon. At sunset, the view is spectacular. Beforehand, guests can tour Titanic The Artifact Exhibition, and afterward, there is a re-enactment of the events on April 14.